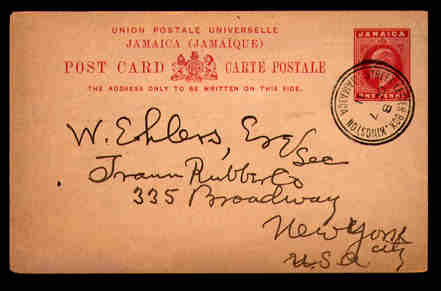 This postal card was sent from Kingston on the south coast of the island of Jamaica. this postal card went into the mails via a street box for mail collection. Such cancels are of interest to many Jamaica collectors. There are no transit or arrival marks indicated for the trip to New York City. (I don't have H&G to permit further identification).